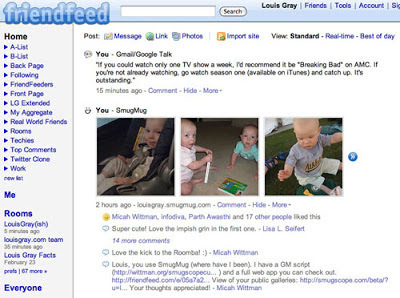 louisgray.com: FriendFeed Turns 5. The One-Time Pioneer Is Still Here. FriendFeed Turns 5. The One-Time Pioneer Is Still Here. Five years ago today, a small aggregation startup called FriendFeed opened its doors, in beta, to intrigued early adopters who wanted to bring all the updates from different services they used into one place and follow friends. As was evident from initial coverage of the site from outlets such as the New York Times and TechCrunch, what grabbed attention as much as the product itself was its founders - a group of four former Googlers who had made their name on products like Gmail and Google Maps. After an admitted slow start, the product gained incredible attention from the Silicon Valley digerati through 2008 as the team expanded and features rolled out with regularity, including the launch of the "Like" button, which became the hallmark action at Facebook, the company's eventual acquirer, a pioneering approach to real-time, and many other aspects which have shown challenging for other startups, including photo display, topical rooms, participation by email and more. By August 2009, less than two years after its initial launch, FriendFeed was gobbled up by Facebook, and work on the site essentially stopped. Now in 2012, two thirds of FriendFeed's initial 12 employees have left Facebook, and yet somehow, the site is still up - despite the occasional outage. FriendFeed Took On Challenging Problems -- Here are 10. The first challenge for FriendFeed to approach was the retrieval of near real-time aggregation from the Web's many services, constantly looking for updates on sites like Flickr for photos, blogs for posts, Twitter for Tweets, and YouTube for your shared videos. The assumption was that when you made an activity elsewhere, it would appear on your feed practically instantaneously. Initiatives that helped this included their own Simple Update Protocol (SUP) and Pubsubhubbub. The second challenge was converting from a site that highlighted activity elsewhere to a thriving community of its own. A feed of all your friend's activities could be hollow without your ability to interact. That was solved with three steps - the first being a bookmarklet that let you share content from other sites directly to FriendFeed, the second being the introduction of commenting and liking articles shared by your friends, and the third, the ability to add a status update directly to the site - which converted from just a catch-all for content started elsewhere to a starting point for new conversations. Nowadays, the like button is so closely associated with Facebook that it's assumed to have been born there. Yet, it was FriendFeed, in a trend that took place regularly, who initiated it only to be mimicked quickly. The third challenge was delivering intelligent search. With backgrounds at Google, it was assumed when FriendFeed would deliver search, it would be done well, and they didn't disappoint. Their advanced search lets users find comments and posts from specific people, all friends, or from everyone. It lets you search on the type of content or any combination. With Twitter remaining unable to produce a search engine with any history, FriendFeed's search archive remains valuable for anything published on the social sphere beyond the last month. The fourth challenge was helping users organize friends into lists. As is seen with Google+ circles and Facebook lists, sorting people into smaller groups is important and challenging. FriendFeed introduced lists in August of 2008, which let people not only put people in the right buckets, but take especially noisy people off their main stream -- extremely helpful. This also delivered what TechCrunch called a "fake follow". The fifth challenge? Moving away from a load and refresh model to one of real time. The concept of new content flowing in from the top of the page, and conversations bumping comments back to the top of the page made FriendFeed have real time at its core. Combine that with advanced search, and realt-time search on FriendFeed became the place to gather for breaking news events, like Apple keynotes. Challenge number six... delivering topical rooms that let people with shared interests participate, with granular sharing models, so rooms could be public, private, or moderated. This could be as simple as a room for intranet-like discussions, organizing the week's poker tournament, or to debate politics endlessly with friends and foes. Text is easy. Getting photos and other rich media is hard. Twitter took years to graduate from a text-only site (with links) to one with embedded images. Even then, they are a click away. FriendFeed made it easy to share multiple photos, or even embed Mp3s so your friends could listen on the site. Shares from YouTube and other services, like Vimeo, could be easily viewed and detected by the service. Not every post from everyone is gold. This is not a surprise. FriendFeed made it so you could hide all updates from specific services, or people, or any combination. If your buddy who writes a great blog tweets too much, FriendFeed had a solution for you. This remains a challenge in most places. Thanks in part to outside developer Gary Burd, later hired, users could post to FriendFeed by sending updates to an email address. Attached photos were attached to the post itself. Very clean. The site also had an iOS-friendly version at http://www.friendfeed.com/iphone which worked very well on a sub 4 inch screen. Though not used a ton, you could embed FriendFeed conversations and feeds on external blogs or websites. Have the conversation in one place and want to showcase it elsewhere? FriendFeed let you do that. Most social services have widgets, but can be as limited as links back to the original source. FriendFeed was much more portable. These innovations, in addition to a growing loyal community, had us hoping FriendFeed could cross the chasm and reach a wide audience beyond those of us who were tech-centric. Interestingly, many of the conversations evolved as users of the platform talked less about startups and platforms, and made the site a place for pictures of kids, silly memes, and glorious food pics. At a time when Twitter was as known for its fail whale as anything else, FriendFeed refused to crash. The team had learned how to scale the product so that even under periods of peak load, sluggish behavior was practically absent. Only in the seemingly annual event of datacenter failures, and eventual site rot due to abandonment for practically three years, has seen the product unavailable. In fact, as the legend tells it, one of the caveats for signing off on the 2009 acquisition was one of the cofounder's wives making the request that FriendFeed stay alive as an independent service indefinitely - which has happened. The initial gut-wrenching response to the acquisition by those of us participating FriendFeed regulars was one of distrust and pessimism, that the pace of innovation and open behavior the small startup had was going to become opaque post-acquisition. It was assumed the relationships built in the community would disappear. Not too long after the purchase did you start to see news that one engineer after another would turn away from Facebook to start something else or simply take time off. There is no question the acquisition of FriendFeed by Facebook was a lucrative one for its employees, and particular its cofounders and earliest hires. While the initial price didn't set records, the acceleration of Facebook's value, recent events notwithstanding, made the purchase an impressive one. Split among a dozen employees and a minor investment from Benchmark, and you can see they did well. 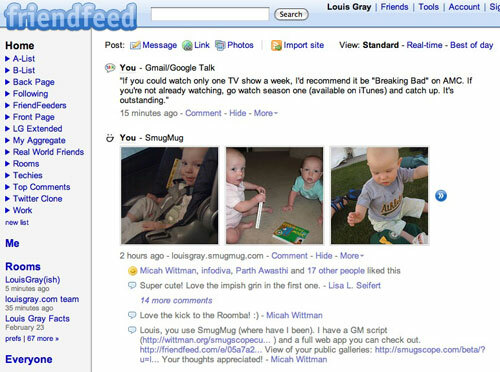 Features initially in FriendFeed later made their way to Facebook, for the most part, and the team dispersed to various corners of the social monolith. Of the 12 employees at time of acquisition, 4 are still employed at Facebook, including Ben Golub, Casey Mueller, Sanjeev Singh and Tudor Bosman. Ana Yang Mueller left last week, following the arrival of her first child. Former Facebook CTO and FriendFeed cofounder Bret Taylor recently left to launch another startup. Jim Norris, another cofounder, is at AeroFS. Dan Hsaio left. Ben Darnell, at Facebook for about half a second, is at DropBox, following Thing Labs and later AOL. Kevin Fox is at Electric Imp. Paul Buchheit is at Y Combinator. Gary Burd left 2 months after the acquisition, preferring not to telecommute from Seattle. Given the array of places these folks have gone after Facebook, it's obvious top talent finds top roles. The FriendFeed team was ahead of its time in a number of ways in developing what it did at the pace it did - even offering up a changelog to show checkins to the site, which updated rapidly. The site turned out a community which I've watched stay fairly solid, despite the neglect, and one that's moved from network to network. At the end of 2009, I even said I would find value from FriendFeed if I were the only one left on the site. Keep in mind Google+ debuted two years later, and that's where many similar interactions take place today, but at the time, it was true. In the thousands of blog posts I've added to this site, I've covered hundreds and hundreds of unique services. There are the rare ones which are so clearly innovative and inspire real community that demand loyalty as FriendFeed did. For those who opted out of the FriendFeed experience, you missed out. For those still hanging on, it's maybe time for a group hug. The small team accomplished incredible stuff, and surprisingly... it's still here. I wonder if it will stay on another five years. Full Disclosures: I work at Google and work with the Google+ team through Developer Relations. I am good friends with multiple former FriendFeed employees on the list. We're buds, essentially.